Sign up and receive Property Email Alerts of Houses for sale in Mossel Bay Golf Estate, Mossel Bay. Amazing 180 degree Indian Ocean views in the well-known secure Mossel Bay Golf Estate. 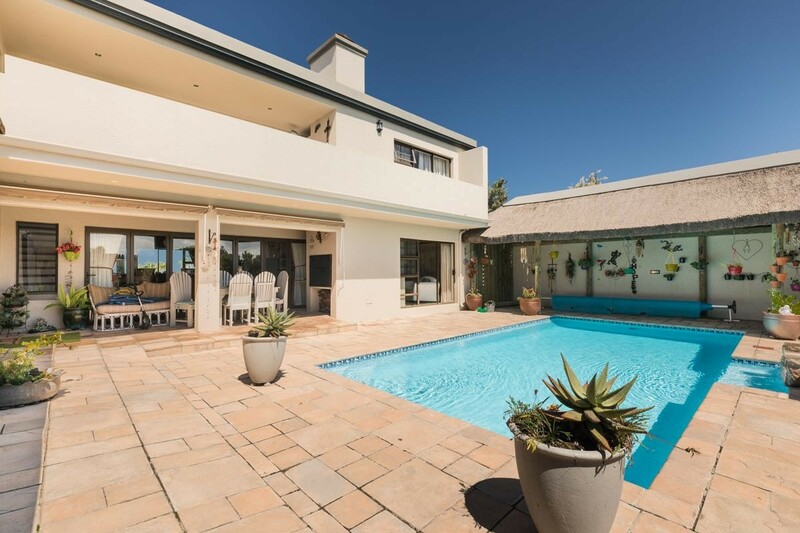 This magnificent prime north facing home is located on the 10th fairway with views of the greens stretched out in front of you, with uninterrupted views of the beautiful Indian Ocean, as well as the Outeniqua Mountains on the other side of the bay. A striking swimming pool is the first thing you see when you enter though the garden gate. An easy home to entertain in with indoor bar facility that opens to the North facing swimming pool with gas braai facilities and walled garden. The Beauty of this Home is most stricking as you walk through the house ... spotless and luxurious, with modern finishes, and impeccable style. The beauty of the house is captivating, you can simply move in, sit on your balcony either up- or downstairs and enjoy the peacefulness of your surroundings. The entrance leads you into spacious living areas. This beautiful, north facing home offers 4 bedrooms, 4.5 bathrooms, a formal lounge, dining room. The spacious kitchen has plenty of cupboards, as well as a walk-in pantry and separate scullery, granite tops, and a study with lots of built in cupboards. Upstairs you have 3 bedrooms, all with en-suite bathrooms, open plan living area with a kitchen leading onto the upper balcony with build in gas braai overlooking the pool and Club House. There is also a spacious games room that can be used as a 5th bedroom. Adding to the value of this property is an extended double garage, sauna, heated towel rails, and underfloor heating to name just a few of the amazing features this home has to offer. A truly magnificent home where you can live the estate life. Sign-up and receive Property Email Alerts of Houses for sale in Mossel Bay Golf Estate, Mossel Bay.